Does processed meat and red meat cause cancer? The International Agency for Research on Cancer (IARC) recently evaluated the role of processed meat and red meat and cancer risk. This report has created significant confusion and media hype around the safety of processed meat and red meat. Does processed meat increase cancer risk? Processed meats include foods such as hot dogs, ham, sausages, corned beef, beef jerky and canned meat that has been salted, cured, fermented, smoked or transformed by other processes for flavor or presentation. Health professionals have suggested for a long time that one of the nutrition factors important for preventing cancer is to be mindful of the amount of processed meat eaten. Processed meats also contain a higher level of sodium than fresh meats. The recent IARC report suggests that a DAILY intake of 50-grams of processed meat can increase the risk of colorectal cancer by about 18%. If you are wondering what 50-grams of processed meat looks like, it would be consuming one hot dog, a few slices of bacon, or 2-3 slices of ham each day. Keep in mind an occasional deli meat turkey sandwich or having bacon for brunch is simply not going to be harmful. The message about reducing processed meat should be targeted to those that are eating deli meat sandwiches every day and relying on processed meat for much of their protein intake. Is red meat safe to eat? The association between red meat (such as beef, veal, pork or lamb) and cancer is weaker and not as clear as the link between processed meat and cancer. It therefore should be treated differently. The IARC report found that the results are mixed with some studies suggesting a link between eating high amounts of red meat and colorectal, pancreatic and prostate cancer with other studies not showing a link. Be careful not to put processed meat and red meat in the same category for health. They are very different. Fresh red meat does not contain the sodium and preservatives that processed meat contains. Fresh red meat also supplies a high level of healthy nutrients such as high quality protein, iron, zinc, vitamin B12 and other B vitamins. For many women (especially those that are prone to iron deficiency), red meat offers one of the single best sources of highly absorbed iron in the food supply. The message to reduce red meat is not targeted to someone eating a reasonable portion of lean beef or pork a handful of times per week. Those that eat red meat every day and choose heavily marbled cuts of meat regularly (instead of leaner cuts) can benefit from reducing their red meat consumption. 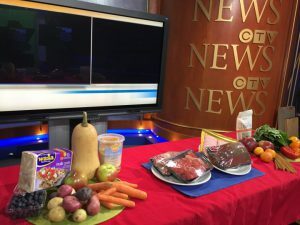 The message to eat less red meat is also targeted to those that regularly have portion distortion and are eating monstrous-sized steaks and other red meat portions at supper. The debate regarding the safety of processed meat and red meat for cancer risk comes down to the frequency, portion size and cooking method. 1. There are no bad foods, only bad overall diets. No one food contributes to poor health or causes cancer. Your overall diet for weeks, months and years is far more significant for your long-term health than a single food you ate today. 2. Keep the big picture in mind. The reality is there are very few cancers that have a single known cause. Most cancer happens because of a mix of many factors such as hereditary genetic factors we can’t change, along with exposure to environmental cancer causing agents, and our lifestyle. It is estimated that 1/3 of all cancers can be prevented by eating well, being active, and maintaining a healthy body weight. Quitting smoking, keeping physically fit, avoiding excessive alcohol consumption, eating enough fruits and veggies and losing weight (if you are overweight) are all other important factors to reduce your risk of cancer. 3. Like most things in life, variety is the spice of life. While you do not require red meat for health, it should be noted that lean fresh red meat contains a good source of nutrients and is a favorite protein for many people. If you enjoy red meat (like we do in our family), keep it as part of your weekly meal plan. Mix it up by incorporating not only red meat but also other sources of protein such as legumes, nuts, seeds, poultry, fish, seafood and eggs. Be mindful that an ideal portion of red meat on your plate is about the size of the palm of your hand (not the size of your plate :). 4. Avoid charring or burning meat. 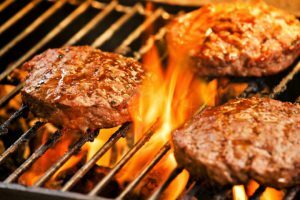 Barbecuing and grilling meat at high temperatures that burn or char meat can cause the formation of cancer causing compounds such as hyterocyclic amines and polycyclic aromatic hydrocarbons. Cook all meats (as well as poultry and seafood) over moderate heat to prevent burning. 5. Downsize processed meats. Don’t eat a deli meat sandwich for lunch every day. As I always say you can eat anything, just not everything. Be choosey about which processed meats you really love and which you can live without. For me, this means you won’t see me eating hot dogs, and most days I choose leftovers instead of deli meat sandwiches. This also means that bacon wrapped scallops will always be part of my life for special appetizers along with farmers market sausages, ham or prosciutto on pizza with my family.